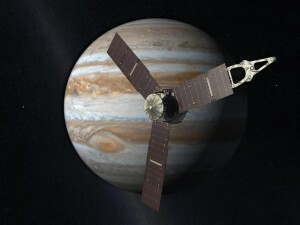 LASP scientist, and CU-Boulder professor of Astrophysical and Planetary Sciences, Fran Bagenal, is leading the Juno team responsible for coordinating observations of Jupiter’s magnetic field in space, with a particular interest in what the gravity fields will reveal about the planet’s deep internal structure, or dynamo. Through the use of twin magnetometers, Juno will study the magnetosphere for the first time near the poles, where enormous magnetic effects appear in the atmosphere as auroras. Bagenal is collaborating with fellow LASP scientists Robert Ergun and Peter Delamere, both members of the Magnetospheres of the Outer Planets Group at LASP, which studies magnetospheric phenomena of the outer solar system in an effort to better understand the electromagnetic processes that dominate space surrounding the outer planets. Ergun specializes in space plasmas at Earth, Mars, and Jupiter, while Delamere has developed models to study the flow of mass and energy through the inner magnetospheres of Jupiter and Saturn. Also working with the Juno mission is LASP graduate student Mariel Desroche, who is modeling the outer region of Jupiter’s magnetosphere and its interaction with the solar wind. By mapping Jupiter’s gravitational and magnetic fields, mission scientists should be able to determine the characteristics of the planet’s interior structure.